With technological advances in the way we communicate come great advances in the way we work. Cubicle walls are falling and independent spirit is rising, but that doesn’t mean the 2020 Marketer will go it alone. Yes, the 9-5 work model will likely disappear as customers demand more instant gratification. These demands will require a reinvention of the way marketers act and react; this will introduce smarter solutions and create a more memorable experience for their brands. Technology will continue to play a major role in the way we communicate with each other, our customers and our communities, on a global scale. From digital conversations, to “always on” video conferencing, and even virtual reality – which will allow teams to assemble anywhere in the world, global companies will find that sharing and collaborating across offices and continents is easier than ever. As more millennials enter and take over this global workforce, the desire for flexibility in the workplace will evolve from what is now considered a “nice to have” perk into a “need to have” requirement. This will play favorably for the company that fosters focused flexibility. A recent Bentley University study shows increased productivity will be a byproduct of this new world of work. Flexibility also allows millennials time to pursue passions they care about like higher education, volunteering, international travel and spending time with their families. Recommendation for the 2020 Marketer: Marketers will be working much more extensively in virtual global teams, which means a break from the standard 9-5, five-day work schedule. This independent work environment means more employee self-discipline will be required, and the global nature of employee collaboration will necessitate more international language skills. Employers should invest in smart communication tools and technologies to foster collaboration among its best global talent. The 2020 Marketer will be more highly connected, independent and well-rounded than the 2015 model, and the marketing profession will be completely reshaped to accommodate the speedy, focused and quickly changing needs of customers and internal stakeholders. The way we operate and the tools we now use will be left in the dust of a new era. 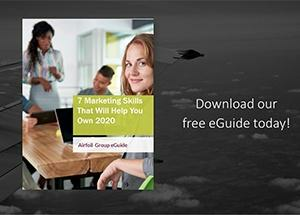 In the new 2020 Marketer eGuide, our experts share more insight to help you better prepare for the next decade. Download our free eGuide below.